Any serious hobbyist-grade two-channel digital oscilloscope is worth a few hundred bucks, with professional lab models reaching into the few thousands. 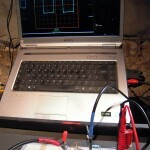 One way to avoid spending too much on such a versatile equipment is to use a personal desktop or laptop computer as a digital oscilloscope. Commercially available plug-and-play probing interfaces and compatible software and drivers are still quite an expensive option. 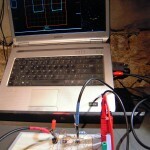 Alternatively, here is a way to turn any GNU/Linux computer with an integrated sound board into a free digital oscilloscope using free software and custom-built probes. Just follow this step-by-step visual guide. All you need is a GNU/Linux system (I recommend the popular and easy-to-install Ubuntu distribution), which has to support your sound hardware. If you can record stereo music at 44100 Hz (CD-quality) through the microphone or aux input of your sound board under GNU/Linux, you’re all set-up. 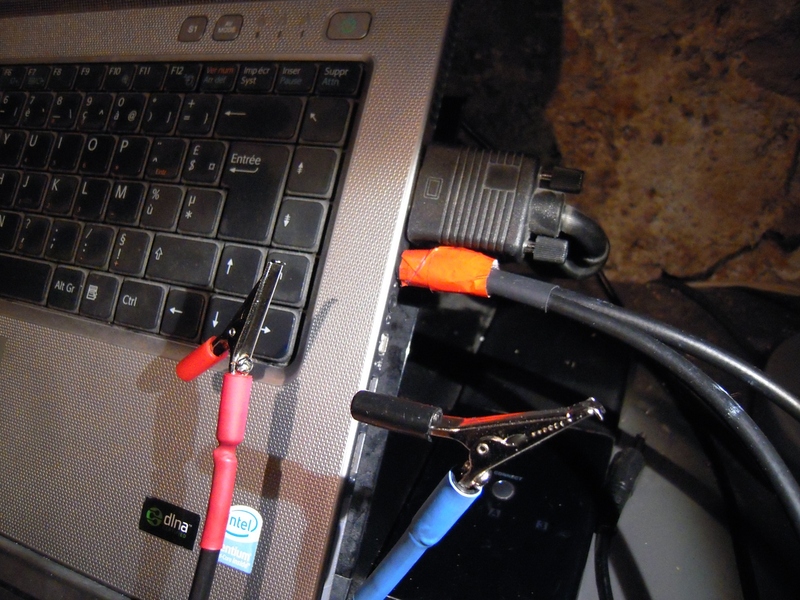 Just build the special probing cable as instructed hereunder (this easy do-it-yourself project should take less than one hour), install the free Xoscope software package, and fire up your brand new real time desktop oscilloscope! The Xoscope software will use your soundboard’s input port (or mic entry) as an interface. We need to build a special measuring cable that will connect to this port. On most sound cards, the mic entry is through a 3.5 mm stereo “mini jack”. 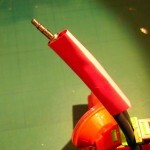 We thus need to build a dual probing cable that connects to this mini-jack port through a mini TRS 1/8″ plug. 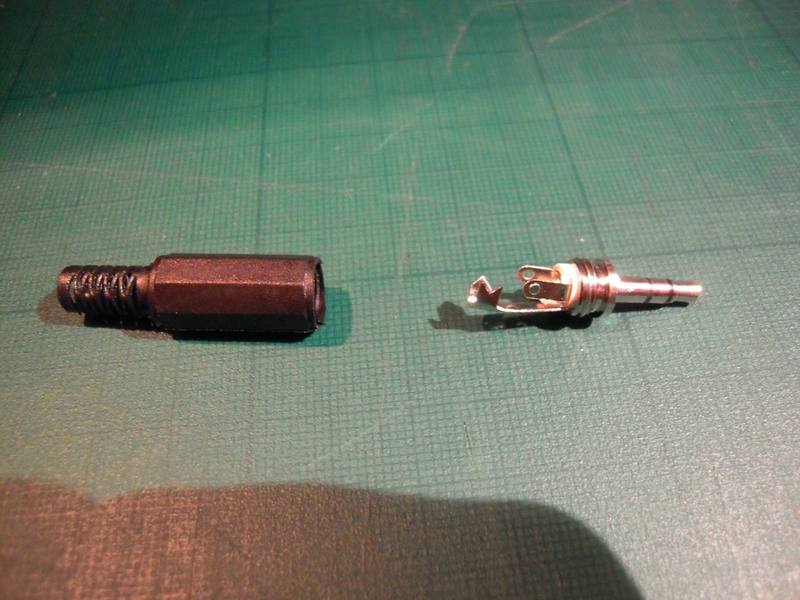 You can either buy a bare TRS stereo mini jack plug, or strip one from an audio/helmet cable that you don’t use. Due to the precise and weak electronic signals that our probing cords will carry, I advise to keep the length as short as practically usable. 1 meter seems an appropriate maximum length to avoid too much power loss due to cable electric resistance. My cable has two 1 m long probing cords and performs great, carrying sharp signals while being long enough to comfortably reach away from the laptop. 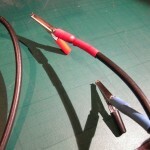 We need two lengths of coax cable to assemble the two oscope probes (remember, we’re aiming for a dual channel scope!). 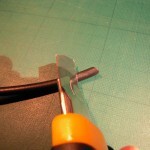 Strip about an inch of the cable at each end using a sharp cutter knife (see pictures). 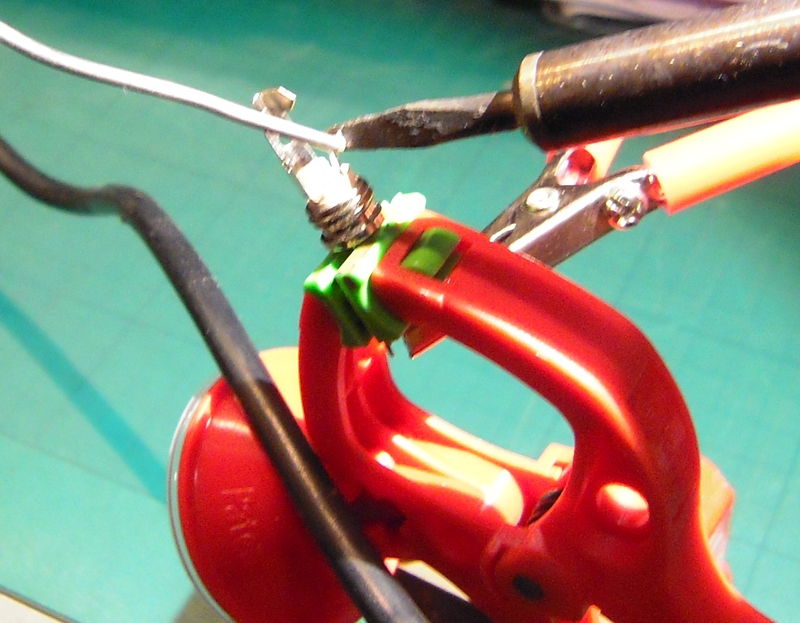 Then carefully proceed to soldering the cable cores to the “tip” and “ring” terminals of the mini-jack plug. 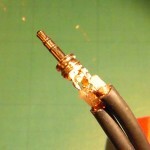 The shielding wire meshes should be twisted together and soldered to the “sleeve” terminal (usually the longest connecting pin on the plug). 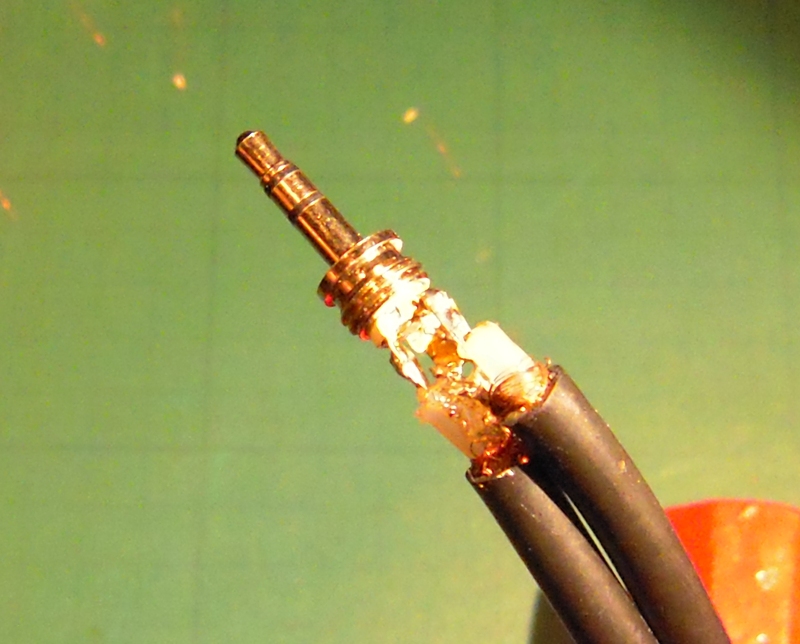 All parts should be pre-tinned before actual soldering. 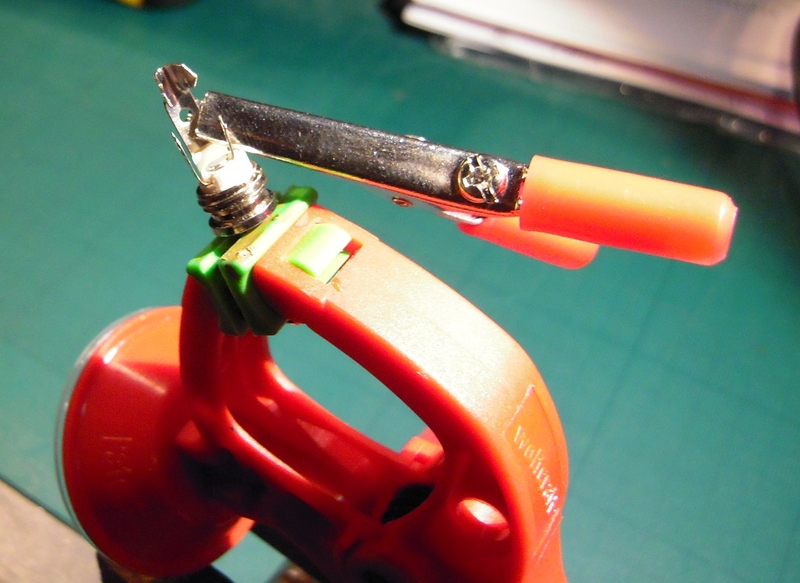 While soldering, attach a metal clip to the mini-plug to help dissipate heat from the iron (otherwise, plastic parts of the plug will melt). 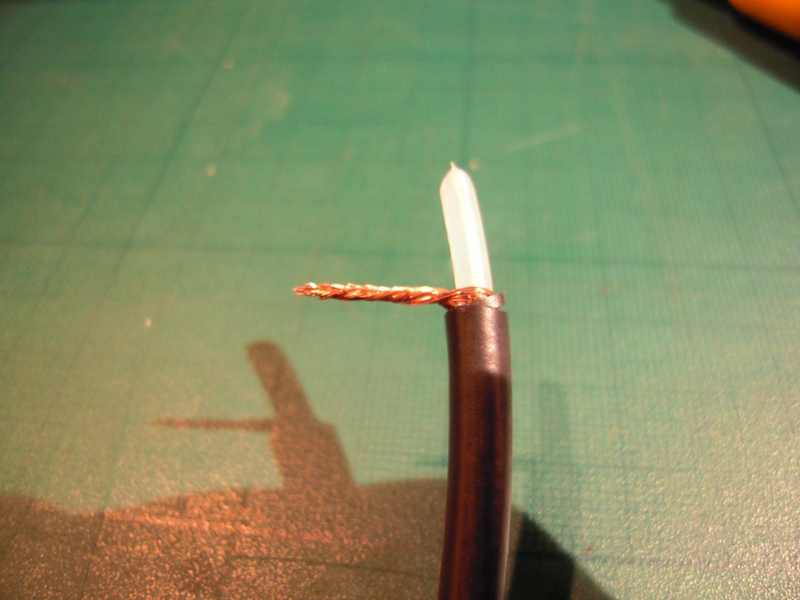 Be careful while soldering to avoid any possible electric contact between the signal cores and the outside shielding thread. 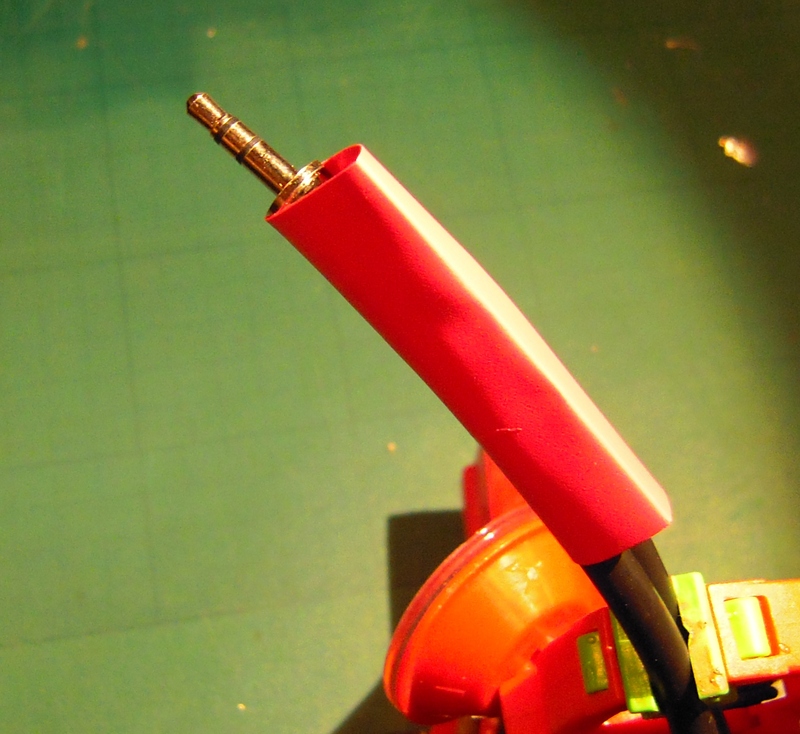 This is rather tricky to achieve given the super-small size of the mini-jack plug. You might have to try more than once, and check with an ohmmeter that there is no electrical continuity between each signal core, and between the core and the shielding. 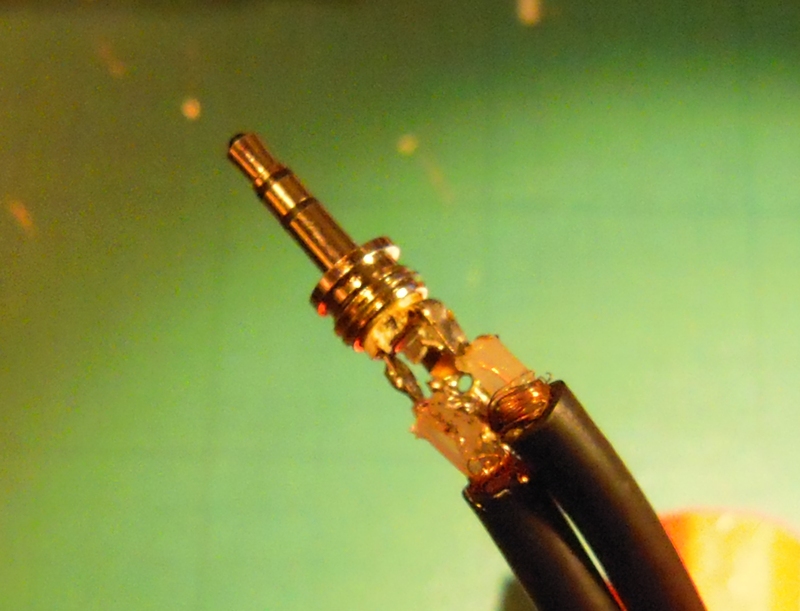 While you are at it, check the continuity between the mini-jack plug tip and the other end of one cable, and between the plug ring and the end of the other cable. 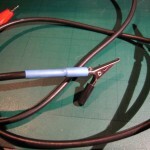 Do this before proceeding with wrapping your soldering work in heat-shrinking cable sleeves (unfortunately, the original mini-jack casing cannot accommodate for a pair of thick coax cables). 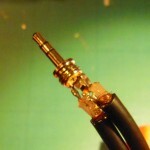 The special shrink-wrap sleeves retract to fit tightly around the plug assembly when slightly heated with a small butane cigarette lighter. I connected the probing ends of the cable to crocodile clips, and again wrapped the connection in heat-shrinking sleeves for a perfect look. 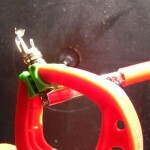 An alternative would be to use probing tips such as the one provided with multimeters, or just a bare copper wire tip. 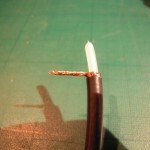 Be careful that the shielding wire net thread should not come into contact with the tip or clips. It should be trimmed and insulated in a way to avoid contact. 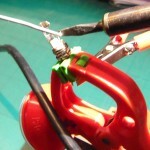 The shielding mesh is not connected to anything on the probing end of the cables. 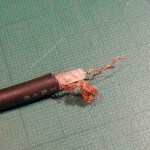 It should not come into contact with any metal parts, or you risk turning your cable into some kind of antenna! Look closely at the photos to get a precise idea of the step-by-step construction of the cable. You can click twice on any photograph to enlarge it. 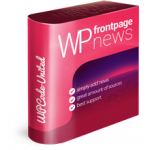 to automatically install the software package and any needed dependencies. The software launcher icon will then be found in the Applications > Sciences menu of Ubuntu. 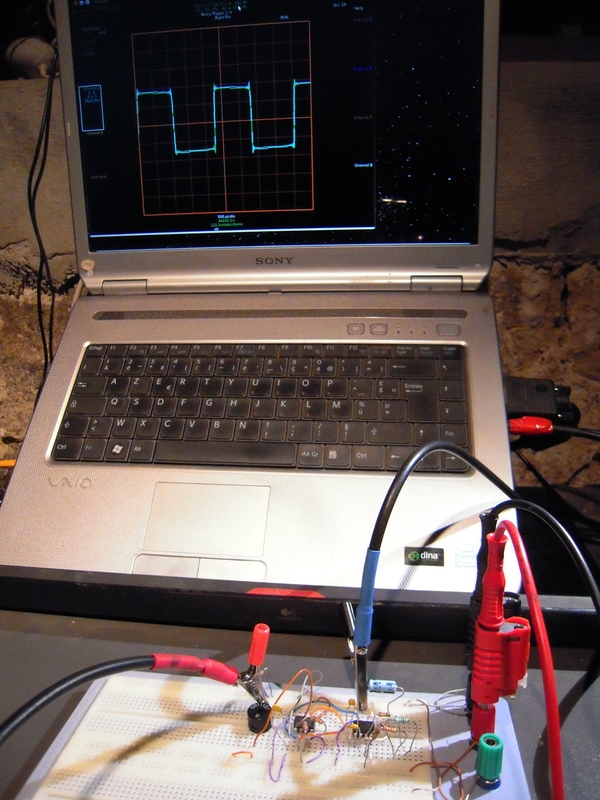 Plug you probing cable into the audio input jack of your sound card, and start experimenting in your own basement with your new, free digital dual-channel real time oscilloscope! If you are using another distribution of GNU/Linux or possibly another OS, check out the Xoscope sourceforge site for other binary distribution, or just download the open sources and compile them to your system. Please read all the very useful comments by Samantha hereunder, for a better design (hardware protection, noise filtering, etc.) A few dollars worth of electronic components will greatly improve the safety and usefulness of this setup. Tnx man great tutorial ! how about max input voltage? can I use it as a multimeter? or shall I remain under 0,5V (typical max voltage of sound cards? @alb.v : your sound card documentation will typically list the max input voltage and power. But you’re right in guessing anything above a couple of volts should be avoided in order to avoid frying your sound card’s input stage. Especially, continuous exposition to DC voltages above 5 Volts will cause probable overheating. For other applications, you will need some additional insulation circuitry, or voltage down-grading. This is just basic hobbyist stuff, and more appropriate for sound-oriented applications (IE visualizing voltage from a guitar, synthesizer, CD player or whatever), or very basic electronic circuitry experiments (educational, showing-off with your kids…). simple but ambitious project, I was writing a Qt plotter but I didn’t find an adequate interface for it .. you saved my time, great work! Maybe a stupid question but: should’t you give the 0 (ground) reference point to the sound card too? Because voltage is between two points right? 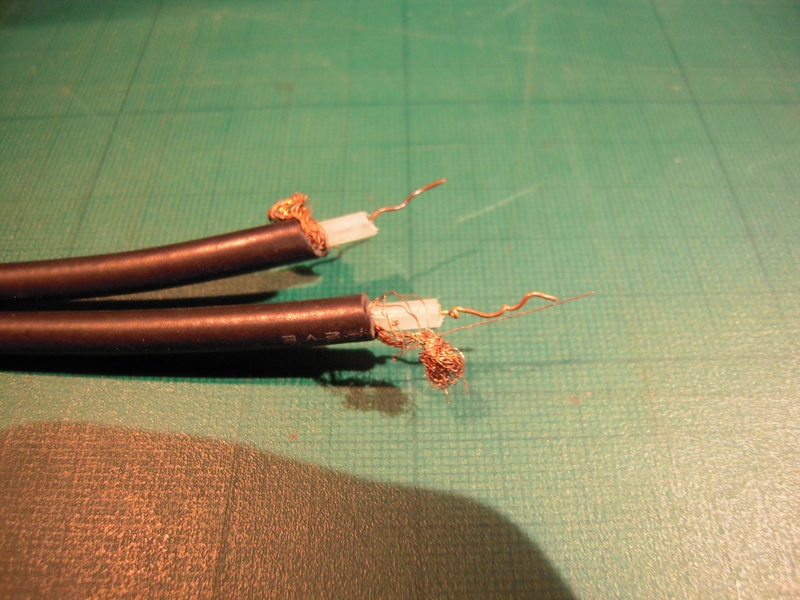 So should’t i connect the ‘shield’ wire’s one end to the circuit ground and the other end to the jack’s common? @Olibali: your question is not stupid at all. I take for granted that your PC is grounded, and that your tested circuit has the same ground reference (if grounded, it should have a common ground connection point with your PC). 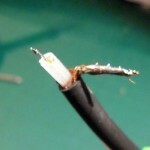 In my experience, grounding the cable shield is not a good idea for two reasons: If for any reason there is a voltage potential difference between your PC’s ground plug and the “other” ground point you connect the shielding to, or if your PC is not correctly grounded, you will have random currents circulating through all your PC’s circuit boards and exiting through your soundcard port. In the past, I have witnessed fried network or serial communication boards on some PCs because of such “ground differences” between machines that had externally grounded cable shieldings. The other reason is that when grounded at both ends, your shield might begin acting like an antenna. I have been experimenting with various grounding schemes and on my setup, and I achieved best results when not adding any additional grounding to the probe shields. If your PC is correctly grounded, as it should for safety reasons, I guess you’ll be all-right too. Otherwise, you can always (carefully) experiment what gives best results for you. But be sure to monitor any current “running out” from your PC through the grounded shield: if you get significant leak voltage, you risk overheating of just plain frying your soundboard or PC motherboard. Thanks for your reply. I’m building a buffer hardware for xoscope. But there was no mention of grounding at all. Then i’ll leave grounding out. I read that my input voltage should be under 0,5V. I don’t understand it. Then how can I measue for example a NE555 timer IC’s output signal? That is about 5V. The voltage is not the only parameter here. What makes component heat is the current. So in fact your soundcard’s input port impedance is the important factor. I can’t say what your own soundcard will accept as maximum input voltage. Just to stay on the safe side, you might decide to stay with the 0,5 V limitation and use simple voltage dividers to make your measurements (you just need one resistor to make a simple voltage divider). However, in my experience, many input ports can deal with up to 5 volts, especially if they are designed to accept “line in” levels (line in level can be up to +/-2V peak). I would not try more than 5V, and as said in a previous comment, this can only be “peak” voltage of some oscillating signal. 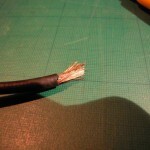 A straight full 5V DC current for more than a few seconds will most probably damage your sound card. To make it short: if you’re unsure, use voltage dividers, and make sure you stay below the 0,5V limit for your first measurements. You can then work your way up a bit by controlling the signal you get on the xoscope display: for exampple, if you see some crunching of the signal, this clearly indicates you’re getting too high / you signal is “too hot”. I see. 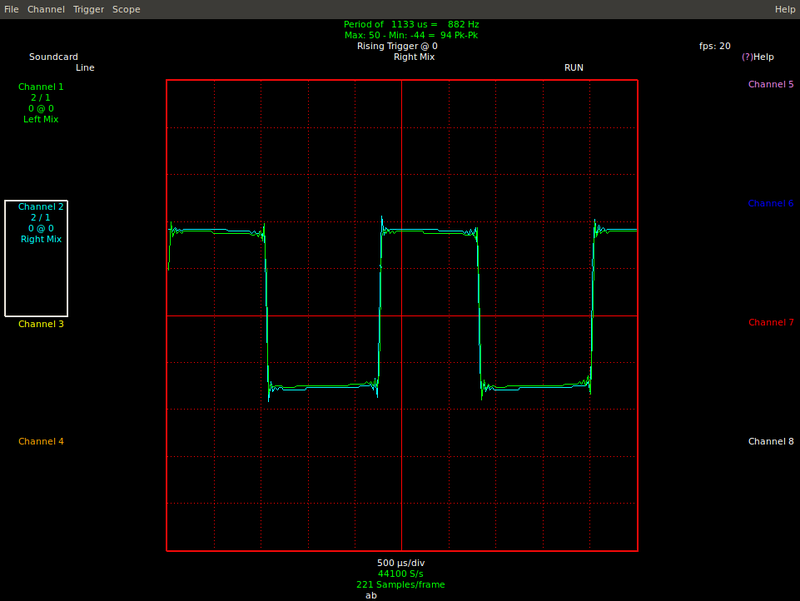 The buffer circuit i was talking about does this voltage dividing stuff with a 100K potenciometer. Now i understand why it’s there. But i think that it’s still dangeorus for my sound card, because if accidentally the potenciometer would turned all the way down ( so no dividing at all ) then my sound card could go wrong. @Olibali: if you’re unsure what type of voltage you will be testing and/or if you’re worried about your sound card, then you should not try this at all. Disclaimer: the DIY tips on my blogs are all to try AT YOUR WN RISK, and most of them will void the warranty of your equipment. 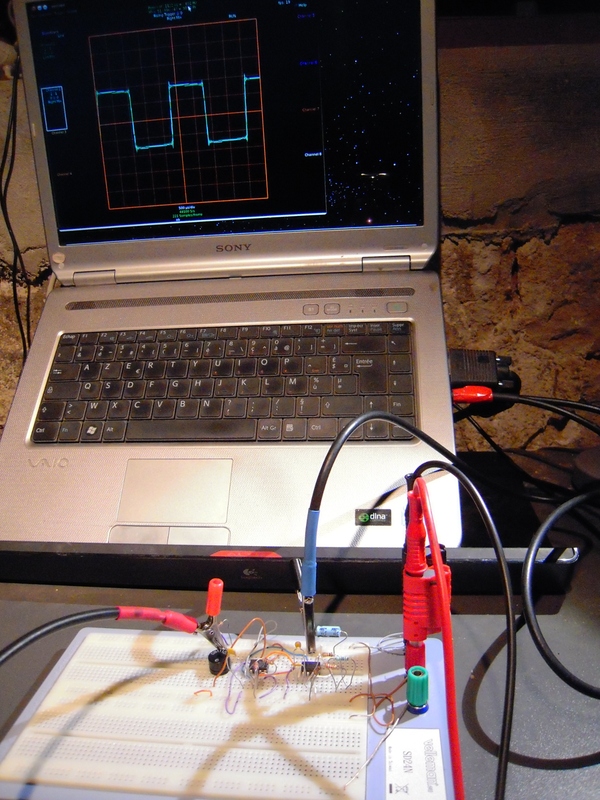 guys.. having such a cheap oscilloscope can be useful and the growing number of comments demonstrate it. Why don’t we work together to design a small circuit (with a potentiometer or a resistor bank or whatever else) to enable this oscilloscope to accept a bigger signal range? from negative voltages to positive higher than 5V. I’ll try after i’m absolutely sure that it’s safe for my sound card. The hardware buffer with the voltage divider included is ok. It can force the voltage levels between +-12V i think so. If you turn the potenciometer it can go lower. The sound card max input let’s say 1V. To ensure that it’s safe i want to cut off what’s higher than 1V then. And zener diode does that. Put this diode modul between the buffer and sound card input and turn the potenciometer down that the highest peak is about 1V then all the data goes through and if any problem occurs the zener protects the sound card. I’m building the circuit. I take photos at every step. If I finished I’ll share what I’ve got. great! let me know if I can help you. Maybe I can draw the schematics in Eagle so we can share it with the community. Mr Dubois, Its good idea to add a functionality to your project like TDR ‘time domain reflectrometer’ a device which can mesure a broken wire distance I can’t find such application on inet I think its easy to implement one right? size : 70.4 MB, compressed file. Haven’t finished yet. I still need 4 zener diodes. I’ll go ahead and buy them. The circuit still not tested for shortcuts and still need to be tested but i think it’s OK. The case is a little brutal forced made. I have to do a lot of tests at school… therefore i’ll continue this after a week or two. I have created the probes as you mentioned and I tried it on osqoop as well as on Xoscope. It works well when I test it with a square wave. But there is a problem – I hope you could throw some light. 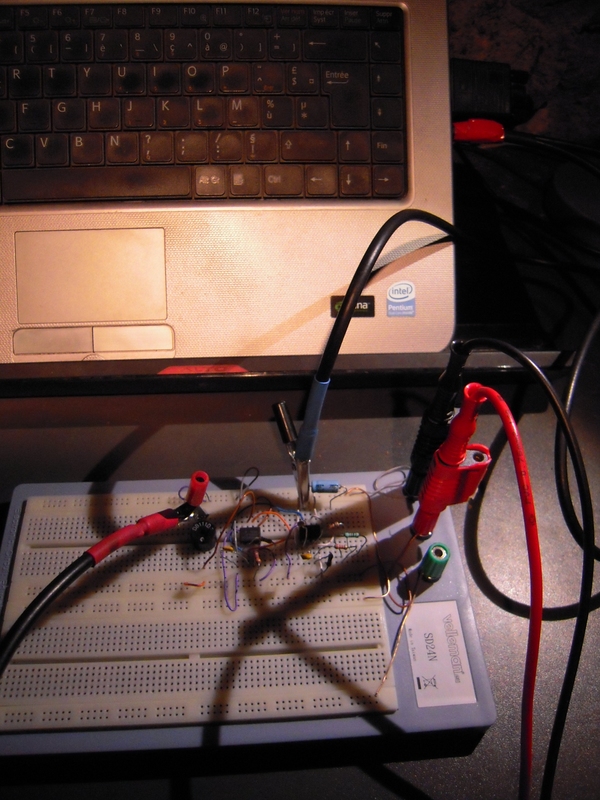 I have a photo diode, and I have connected it to few opamps for boosting the signal. 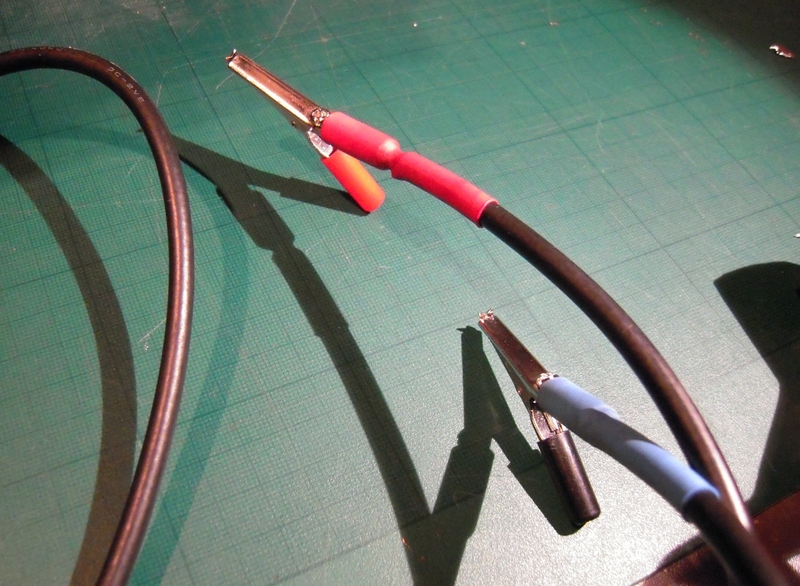 I am feeding the output of the opamp to the sound card using the cable. I have a peculiar problem. 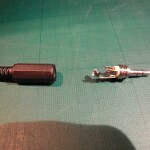 i.e I get noises if the stereo pin is fully inserted in to the mic socket. The noise disappears and I get a smooth signal if I slightly pull the stereo pin so that the ground doesn’t touch the mic socket’s outer ring. 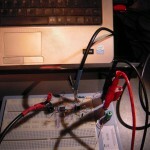 This happens only with this photo diode opamp circuitry. A simple square wave oscillator signal’s does not produce any noise irrespective of the stereo pin being fully inserted (i.e ground of stereo pin getting in contact with the mic socket’s outer ring). I can send you screen shots of the wave form when the pin is fully inserted and when slightly pulled out. Can you think of a reason for this behaviour? I have tested the stereo pin there is no short circuit between the wires. 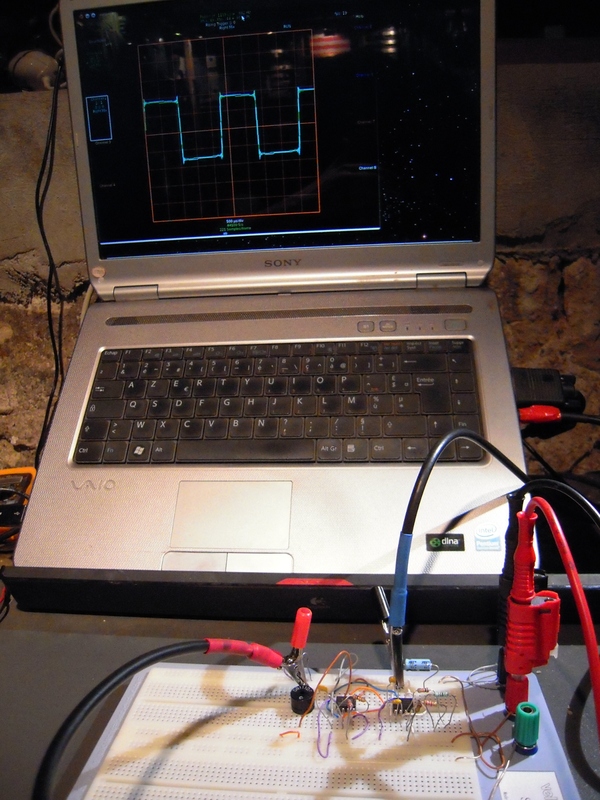 Im working of developing a virtual oscilloscope which uses sound card. I understand that sound cards dont take high voltages and potentiometers can be used. If i give a sinusoidal input of say 7Vp-p, use pot to reduce it to 3V, would i be able to display the original 7Vp-p wave in my display of my oscilloscope? Im developing a GUI using MATLAB. 1) Your soundcard’s input impedance (resistance) is likely too low to take readings without appreciably altering the circuit under test (you are, essentially, connecting a load in parallel whenever you attach your test lead, after all). Using an op-amp buffer will increase your input impedance to usable levels. 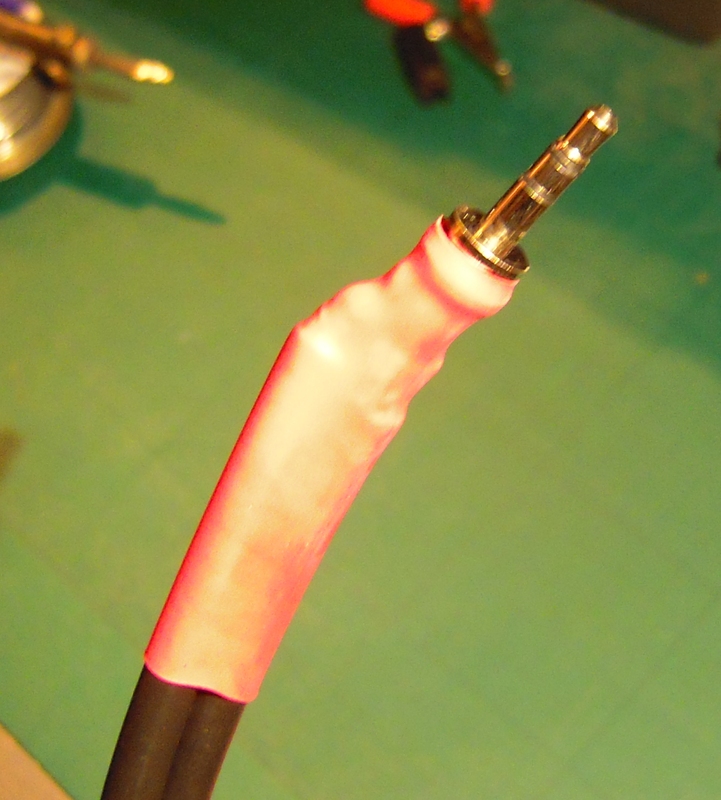 2) To protect your soundcard since it probably doesn’t have any input protection to speak of. 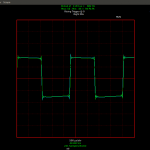 Youll want to chose an op-amp that can operate under a ‘single rail supply’ and that has as low of an ‘input bias current’ and ‘input bias offset’ current as possible. It should be a ‘rail-to-rail’ device. The other statistics really don’t matter. Five minutes on Digikey shows the AD8601 to fit the bill at under two dollars, but any op-amp that satisfies the above requirements should do. 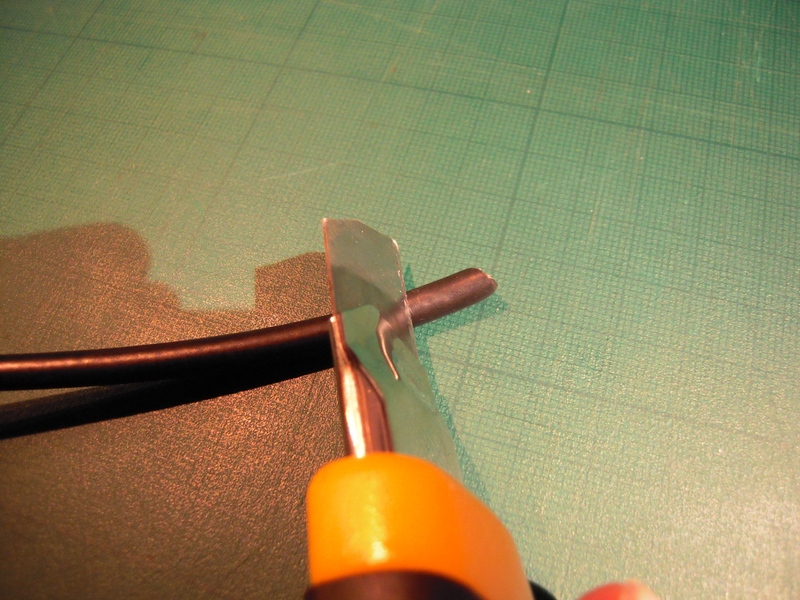 1) Cut the end off of a USB cable and strip the wires so that you’re able to plug the remainder of the cord into your computer. 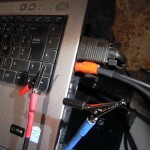 2) Using your multimeter (or a battery/led as a continuity tester) identify the wire inside the cable that is connected to the metal frame of the USB plug. It is most likely the black wire if the wires are of different colors. 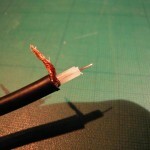 This wire provides GND (ground). Label it. 3) The two middle pins in the USB plug are for data. The outside pins are for power. 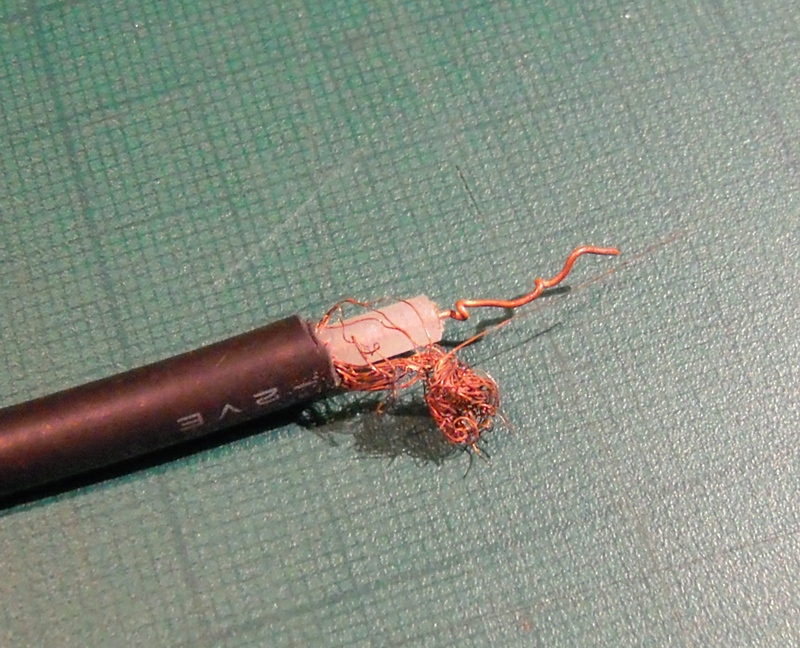 Identify the other wire in the cable that is common to one of the power pins and label it +5V. 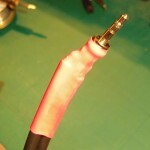 If the wires are not all the same color, this wire should be red. 4) Connect the GND wire to the V- pin on the op-amp. 5) Connect the +5V wire to the V+ pin on the op-amp. 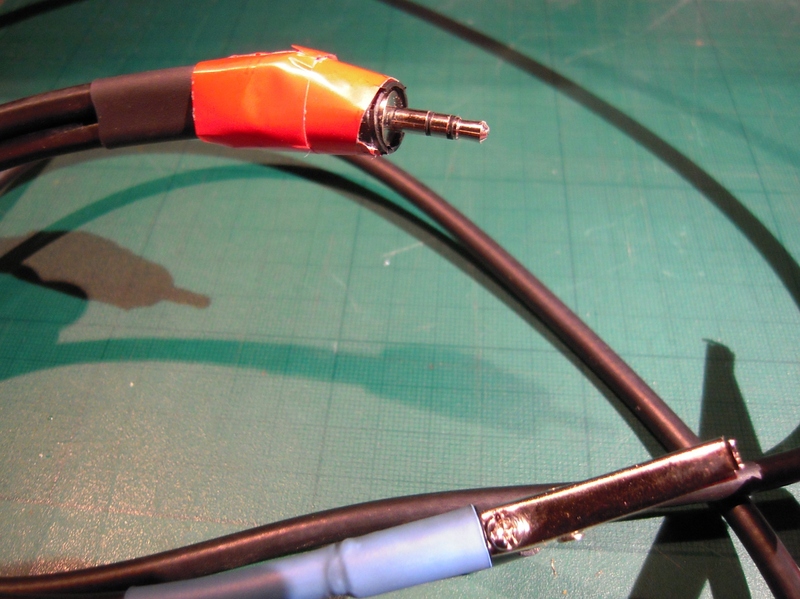 6) Cut the end off of an audio cable and plug it into your headphone jack. 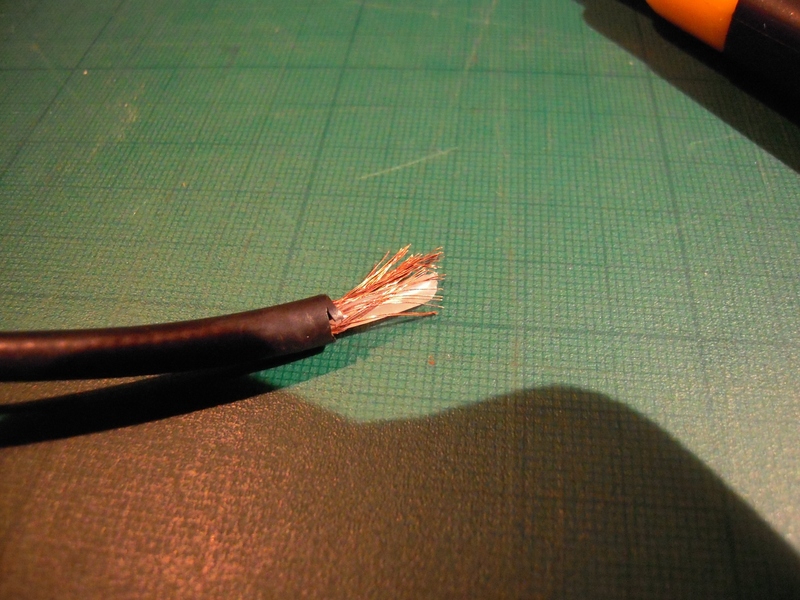 7) Identify which of the two wires is electrically common with the GND wire from the USB cable. 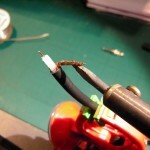 Attach this wire to the V- pin on the op-amp. 8) The other wire from the headphone output should be connected to the output pin of the op-amp. 9) The output pin of the op-amp should also be shorted to the inverting input pin. 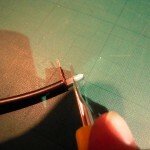 10) Attach the wire you plan to use to probe the circuit to the non-inverting input pin of the op-amp. 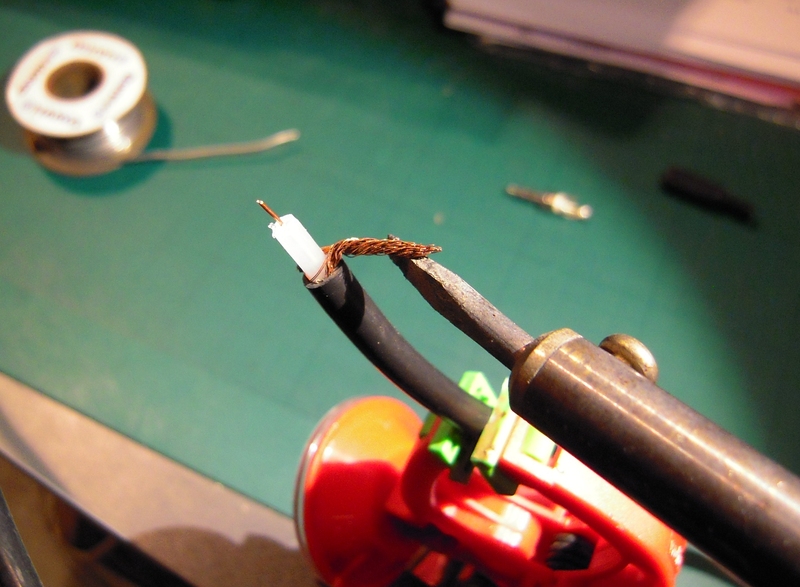 11) If you want to ground your test circuit to your ‘scope’ run the ground lead from the V- pin to your alegator clip. WARNING: NEVER CONNECT THIS TO ANYTHING OTHER THAN THE EARTH GROUND OF THE CIRCUIT UNDER TEST! Enjoy! If the circuit misbehaves consider tying the test lead to GND through a 10 mega-ohm resistor to prevent the non-inverting input from ‘floating’. WARNING: Never, ever connect the ground lead to anything other than earth/chasis ground on the equipment under test. If your circuit is not tied to earth then attach it to the ground reference point in the circuit but do not use the ground lead like you would use the black probe in a multimeter. This is not a limitation of the buffer, it has to do with the fact that the computer’s GND is likely tied to the mains equipment ground and if you connect that to something that isn’t at earth/ground potential you will cause a dangerous short circuit! OH! I forgot to mention! A 0.1nF ceramic capacitor should be soldered between the V+ and V- pins to input voltage bypass filtering! 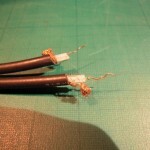 Normal stranded wire is perfectly acceptable for leads as well. 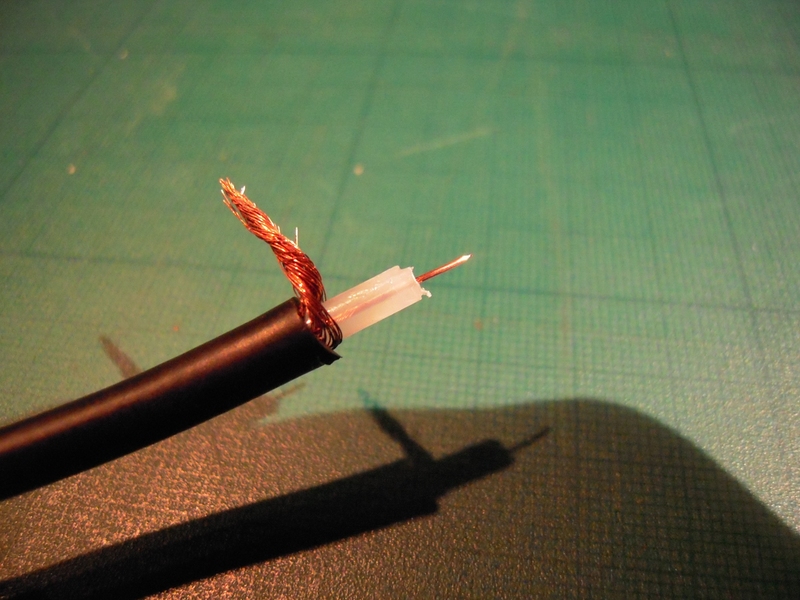 There’s no reason to use coaxial cable. 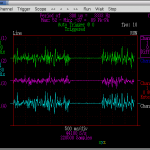 Proper oscilloscopes have to be able to resolve frequencies of at least 60MHz, well into the radio frequencies. Higher end scopes can go as high as several GHz. On the other hand, this scope will have a usable bandwidth of about 4kHz and the leads will have to carry frequencies up to the Nyquist frequency of the ADC which for the typical mic input is 22kHz but could be as high as 96kHz. Your measurable frequencies are 1/2 your sample rate. As a rule of thumb, your usable bandwidth on a scope is 1/10 your sample rate (you can’t go up to the highest measurable frequency or you can’t distinguish between waveform shapes). Anyway, none of these frequencies gets anywhere close to radio frequencies. Hey thanks a lot @Samantha, those are great comments to complement my initial post. I myself was mainly interested in exploring low frequencies of the audio range, for which the sampling rates of a soundcard are enough, but you are right we are far from radio. 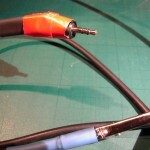 For whatever reason, I have found that coaxial leads tend to be less prone to LF interference than normal stranded wire. 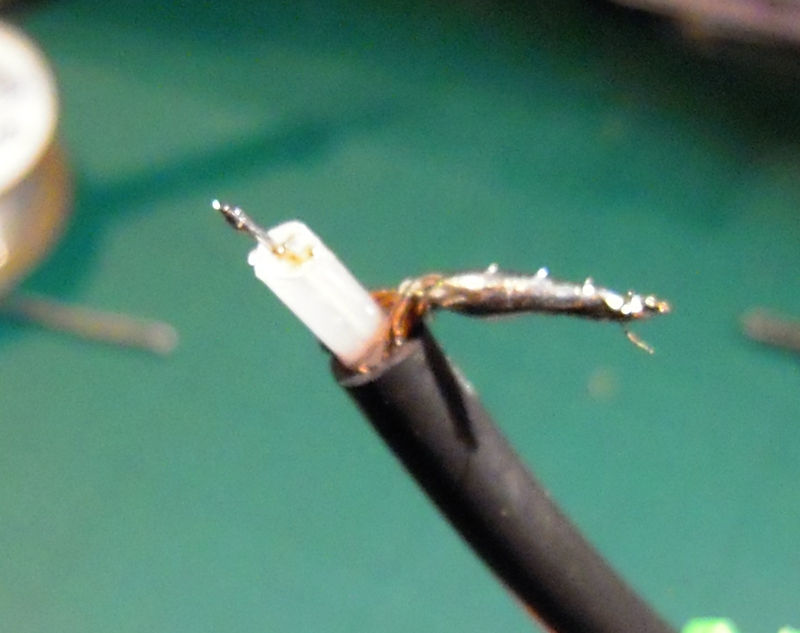 Maybe it’s the quality of the cable itself, maybe the cable I used provided some kind of shielding. Anyway, thanks for your valuable input! 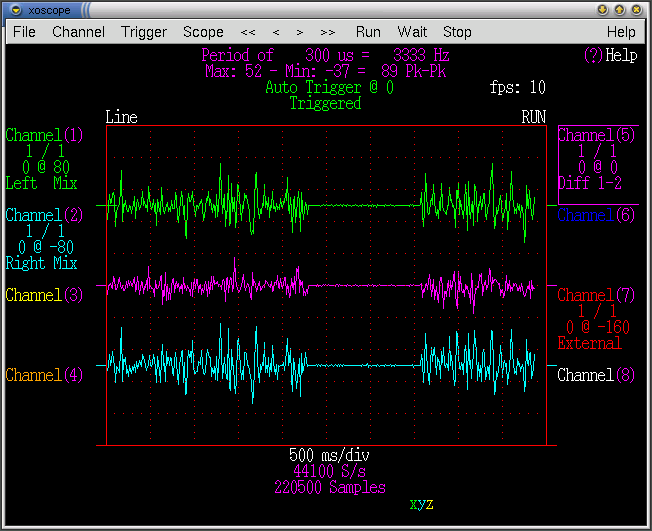 1) If the signal voltage drops below reference ground potential the op-amp will clip and distort the waveform. This shouldn’t be a problem with battery-powered circuits provided that you connect the reference ground clip to the most negative point in the circuit. WARNING: If the circuit under test is mains powered or is connected to earth in any way (connected to water pipe, plugged into USB, ect…) then the ONLY safe place to attach the reference ground clip is to earth/chasis ground. 2) If the signal voltage goes above +5V DC the amplifier will clip. 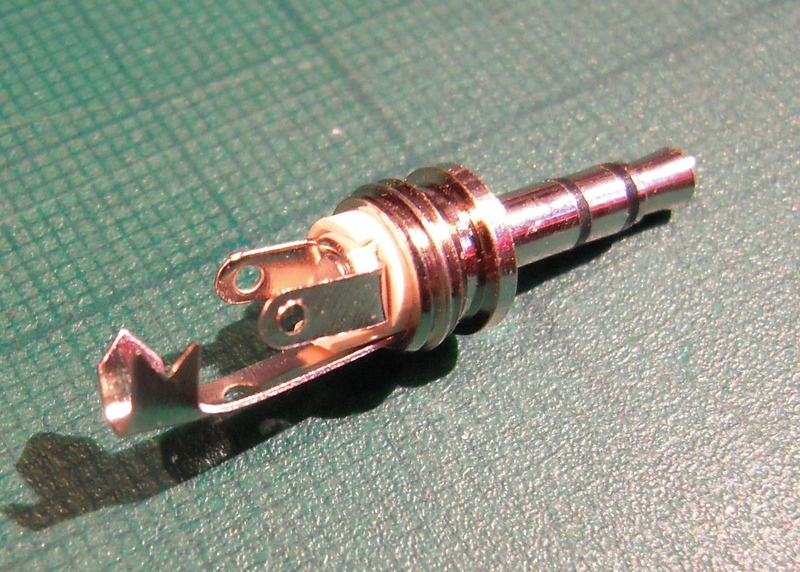 If you want to measure voltages above +5V DC then you’ll want to use a potentiometer (trimpot). 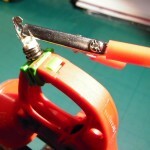 Attach one end of the trimpot to your test lead and attach the other end to the wiper. 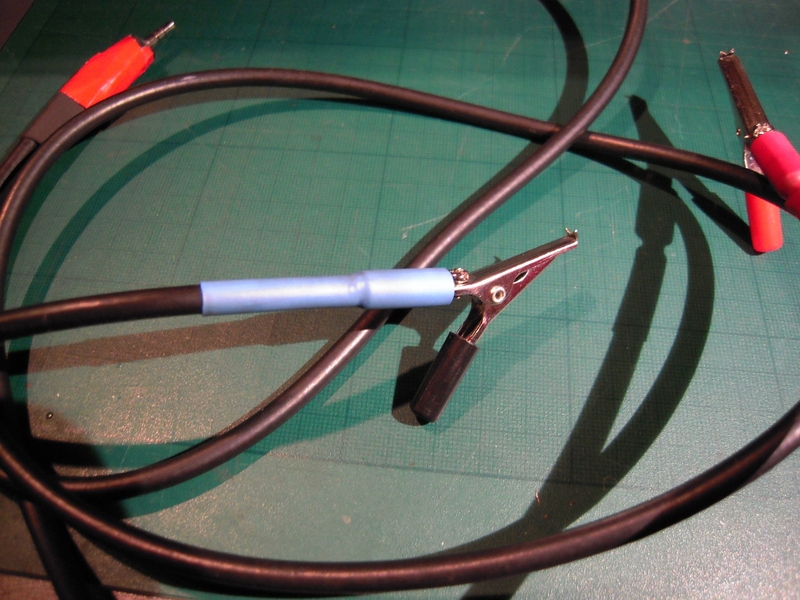 Then attach the wiper to the non-inverting input of the op-amp. The input impedance of your scope will now be equal to the total resistance of the potentiometer. 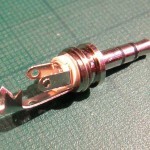 Aim to buy a 10 mega-ohm trimpot. 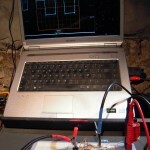 If you feel the need to measure voltages below your ground reference you could opt to AC couple the input to the op-amp. 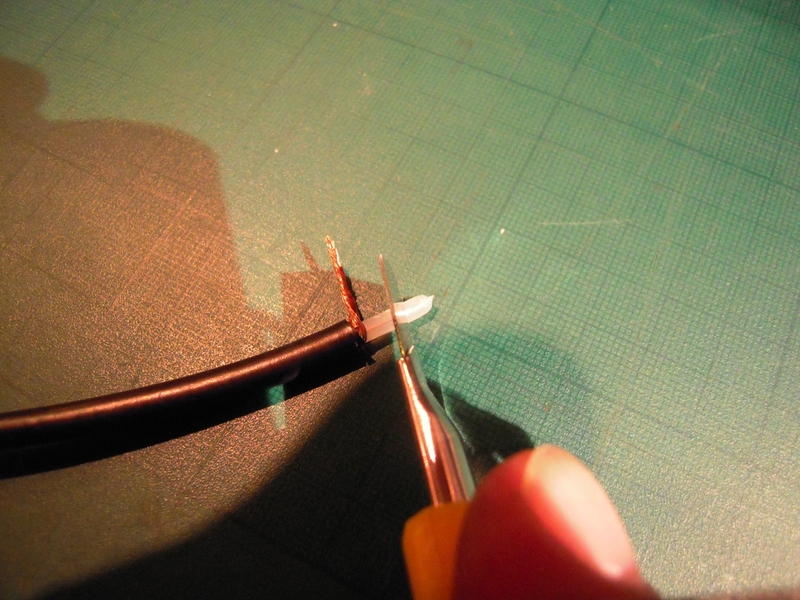 To do this youll want to attach the test lead to a ceramic capacitor (0.1nF maybe?) and then attach the capacitor to the non-inverting input pin of the op-amp. Then you’ll want to attach a high value resistor (1-10 mega-ohm) between the non-inverting input pin and V+ and another, identical resistor between the non-inverting input pin and V-. Note that AC coupling the input will limit your input to +/- 2.5V AC instead of +5V DC. @Samantha: great insights. I just added a paragraph at the end of my initial article to encourage visitors to read through all your valuable observations. Actually… now that I’ve had a few hours to mull on it I’m not sure my idea for AC coupling the AD8601 circuit is the best idea. For one thing the amplifier will put out a steady 2.5V DC so you’d be best to decouple the output as well (the microphone input should be AC coupled anyway but who knows how it’s implemented and it might not take well to the DC offset). My design for the AD8601 was designed to use power from the computer but if that’s no longer a requirement a better circuit could probably be designed using a 9V battery to supply dual-rail power to a TL071. You’d basically hook the battery terminals up to V+ and V- and then hook each terminal to the GND (coming from the ground wire from the microphone plug) through identical resistors. Bonus point in that you could buy a whole handful of TL071s for the cost of an AD8601 and you remove the need to maul a USB cable. I’ll experiment a bit with my breadboard so I don’t put my foot too far down my throat. Once I verify that everything works correctly I’ll make a schematic. is this work with windows.(xp,7,8)? @Khaled : I don’t use Windows and don’t want anytghing to do with it, so I can’t answer your question. The Xoscope software is Linux-only. You can easily install GNU Linux on your Windows machine, or (better) use dual-boot. There are many solutions around. Could you possibly provide a better explanation or picture about the alligator clips. 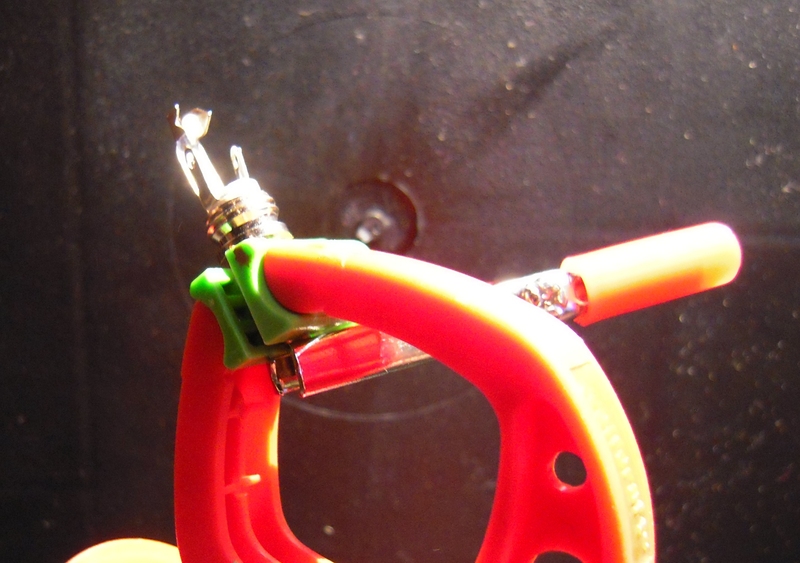 do i solder the center wire only to the alligator clip and cut off the mesh on the probing end? Yes, only solder the center core. In the pictures, it looks like you connect the center wires and one of the shieldings (shielding to ground) to the jack plug, then you don’t connect the shielding to anything else? This floating ground doesn’t sound right. I would think you should put another alligator clip on the shielding and connect that to the ground of your circuit, right? I’m curious about getting precise voltage levels from this scope. I guess I could connect it to a known static 5v and 3v signal, assume a linear slope, and calibrate that way? Or am I missing something. Thanks for the write-up. It’s a great way for a start-up hobbyist to get his hands dirty and get started with this kind of investigation!